Last weekend I took a short holiday, and on the way back home we visited the National Trust property Stourhead. It's a fantastic old estate with a beautiful garden and lovely house, made even more intriguing by the fact that people are still living in it today! One thing that caught my attention as we were walking around was a pen of sheep. Actually, from afar we thought they were goats, because they were all horned and the ones we noticed first had short hair. 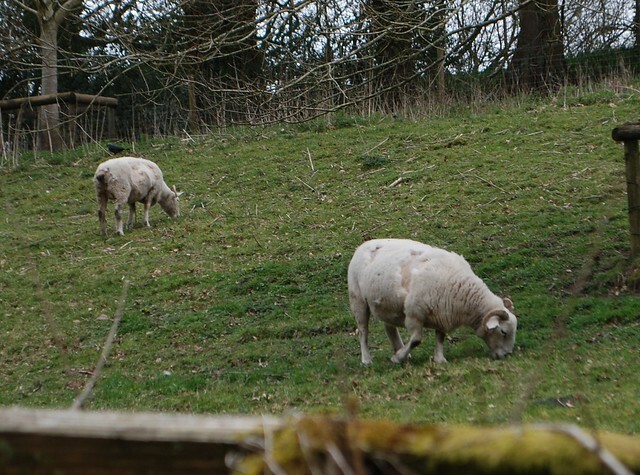 Upon closer inspection though, yes, sheep! The fences and bushes around their enclosure were scattered with chunks of wool. 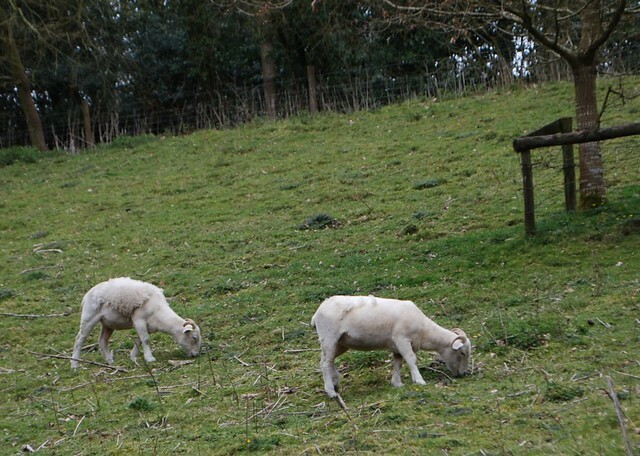 Likewise, some of the sheep appeared to have rather patchy coats, and some were missing entirely. How curious, I thought to myself. Why are these sheep shedding? It turns out, it's completely natural. These are Wiltshire Horn sheep, right in the middle of the yearly shedding of their coat. They're a hair breed of sheep, kept for meat or for grazing. The shedding is intentional - they're marketed as an easy-care breed, in an age where sadly the cost and effort of shearing isn't always worth the price of the wool. It's not a new breed, though - its lineage can be traced back hundreds of years. He seemed nice enough, despite all the bleating - maybe he wasn't keen on me pinching his wool? That's just barely reaching 4cm. 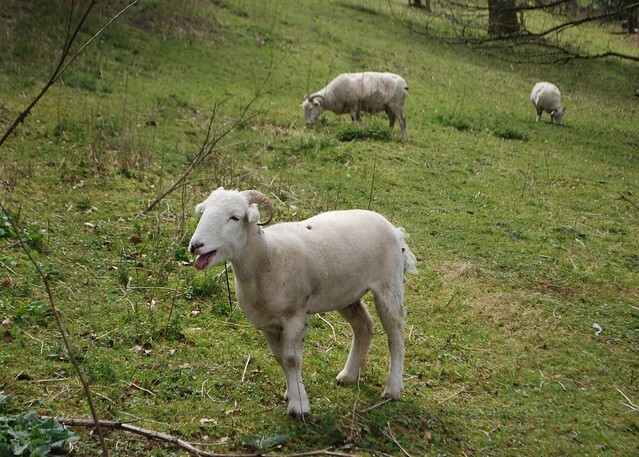 I looked in the FFSB - Wiltshire Horn is mentioned, in a short section on hair sheep, but not any information. Was it spinnable? Well, I would have to see. 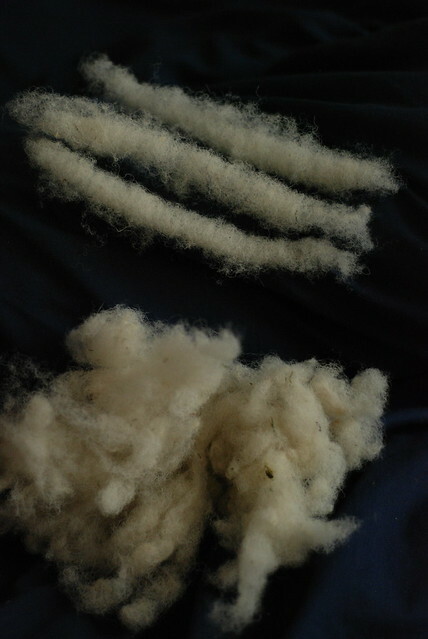 First thing, I washed the fleece, to remove at least some of the lanolin, suint, and who knows what else that was on it. 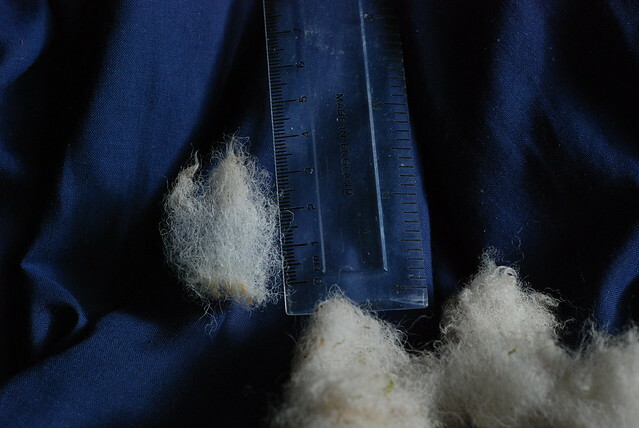 Then, I carded it into thin little rolags. 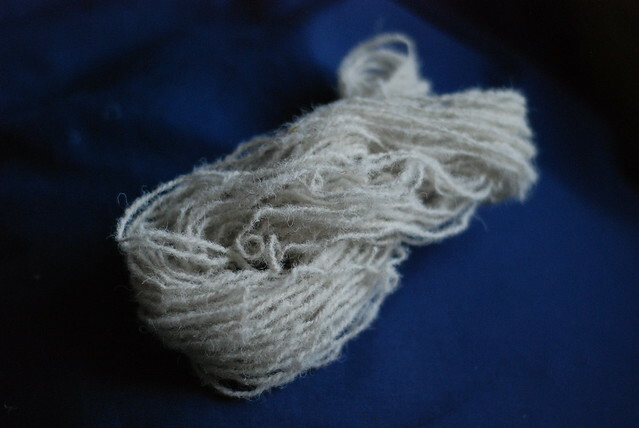 These rolags (so small, more like punis) spun long-draw beautifully. I was left with this sweet little skein of yarn - textured, with its share of kemp, but really no scratchier than a lot of proper wool-bearing sheep, and really not a lot of trouble to spin despite its length. Let's face it, while it's very short for a wool, compared to camel or vicuna, it was a cakewalk. 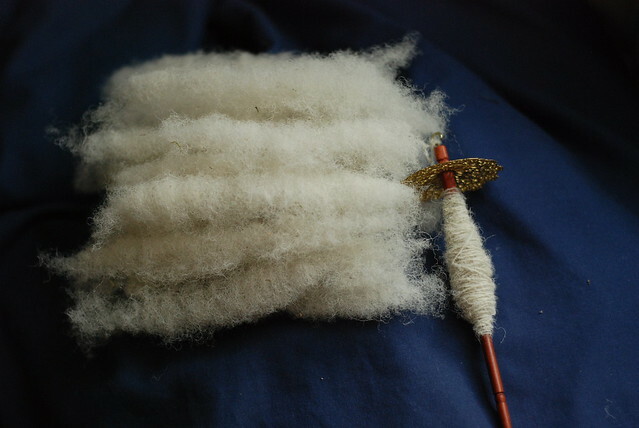 What can I say - I like my bouncy wools, and I liked spinning this!